How can anyone resist picking up something like Trader Joe's Double Chocolate Hot Coca Stirring Spoons? With Mini Marshmallows, to boot! It's such a simple, easy, almost no-brainer kinda concept. Get a cheap mini plastic spoon, stick in an ice cube tray-type square of chocolate, with a couple mini marshmallows on top. Package up in small individual sized packets, charge 99 cents a pop. What this causes, naturally, is people like me to say "OOOOOOOOO" and without much regard to either grocery store budget (to channel Macklemore, shoot, it's just 99 cents) or the incoming surge of Halloween candy to pick it up as a) something fun for ourselves or b) something fun for ourselves and the kids. I mean, hot chocolate is already a pretty fun deal, but something like this? 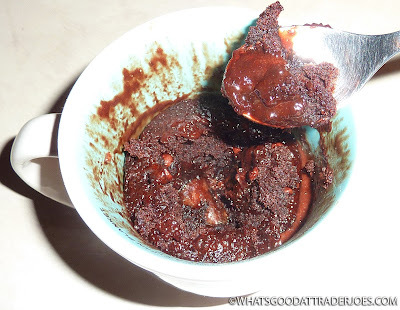 Watching a big blob of chocolate melt and slowly darken and sweeten a hot steamy mug of milk seems so much more fun than incessantly stirring a packet of powder. It's a great concept, these TJ's cocoa stirring spoons, but it just doesn't quite work as well as hoped. First, they kinda take forever to melt, and my kids only have so much attention span, as do I. I didn't clock it, but it was more than advetrtised, for sure. Secondly, the melt isn't even all that great - there's still specks of stuff all over the place in there, which helps leave a kinda chalkiness or clumpiness. It's not as smooth as hoped. A lot of this could be forgiven, but the outcome isn't even terribly tasty hot chocolate. it's very meh, kinda bland, even. I'm thinking it might be because of the combo of two chocolates, dark and milk. Either one or the others, all by themselves, would make a much more developed flavor instead of more or less cancelling each other out. It's extremely mediocre hot chocolate, at best, lacking a lot of richness. I can't imagine using water instead of milk for these - it'd be a lot worse, I think. This is definitely one of those one-time gimmicky kinda buys for us, in all likelihood. Although we are somewhat tempted to buy once more but try them as a candy snack and not a beverage kit, so there's still a chance...yet our family is all pretty underwhlemed, even the kids. Mehs from all four of us. 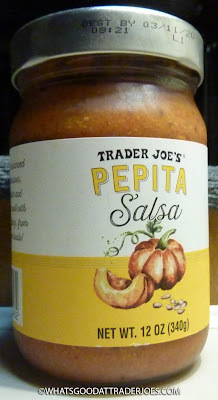 "Pepita" sounds more exotic than "pumpkin seed." Maybe that's why Trader Joe's employs that word here...and other places. I mean, they're clearly not shy about slapping the word "pumpkin" on their products left and right, although we've seen that trend slow in 2018. To everything, turn, turn and all that. Maybe The Age of the Pepita is upon us...? If you type "pepita" into Google Translate as a Spanish word, the corresponding English word they give you is "nugget." I asked Sonia, who's bilingual, if that's correct. She wasn't sure. She just thought it meant pumpkin seed. Whatever. Nuggets or seeds or exotic Latin snacky things, I was just expecting this salsa to be full of them—crunchy, nutty chunks of delight. I'm not saying they're not there. I'm just saying they aren't there the way I expected them to be there. The salsa is chunky, for sure. That's always good in my opinion. 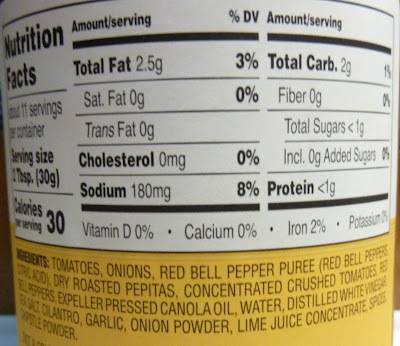 There are tomato chunks, onion bits...and maybe some pieces of other things. But I wanted big crisp seeds. 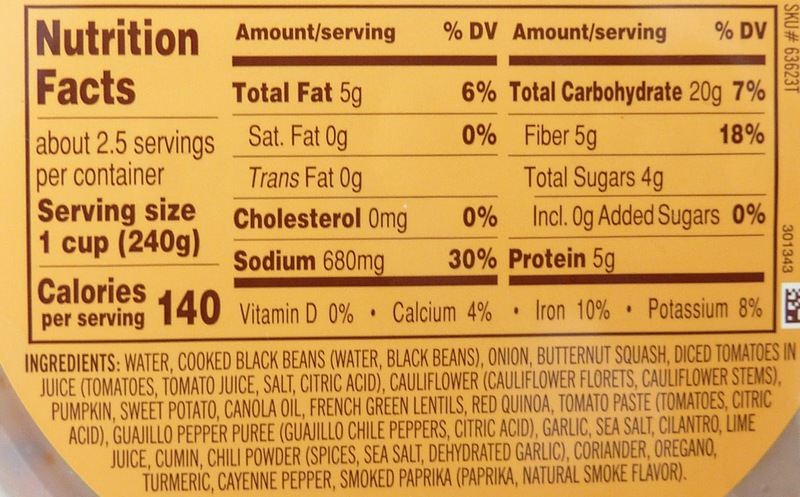 We're not sure if they've been partially dissolved in the liquid parts of the salsa or if they're chopped up into teeny tiny little bits, but there aren't any big crunchy pumpkin seeds. That's my complaint. It's a big complaint. BUT, it's also my ONLY complaint. 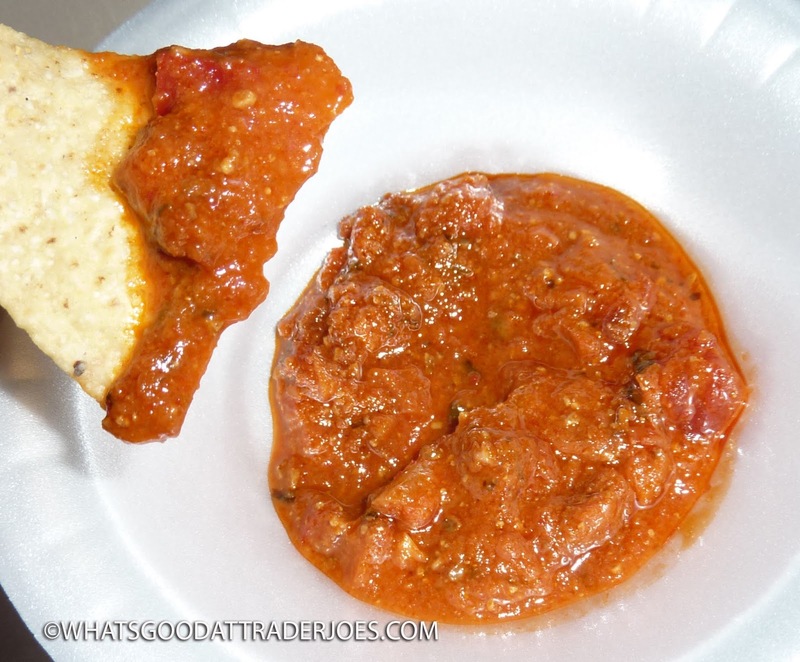 Because other than that, this salsa rocks. It's flavorful, smoky, harvesty, and thick. There's a bit of a kick to it. Not a lot. I think it's more of a garlicky kick than a hot peppery kick, if you know what I mean. 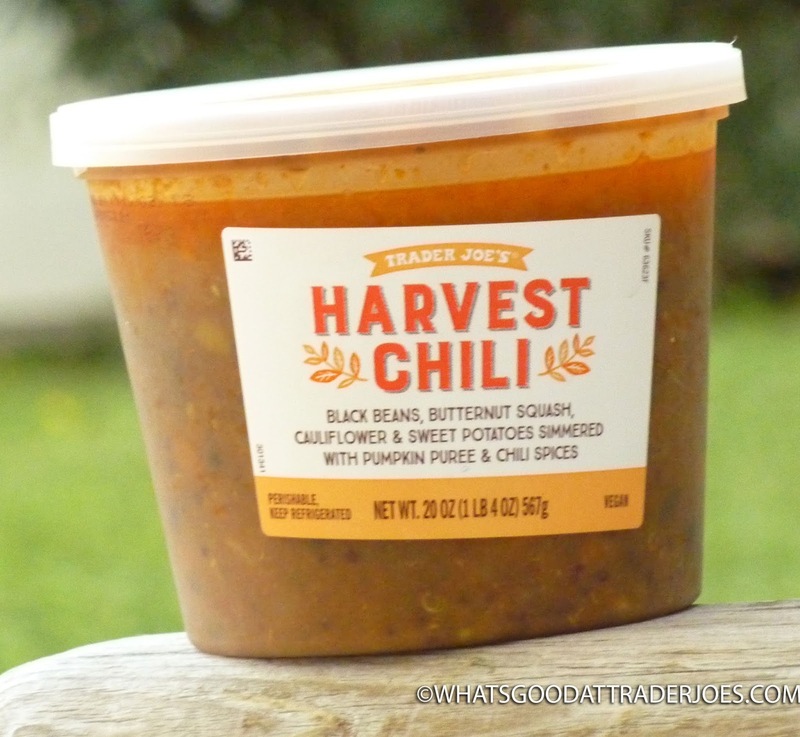 Still spikes all that flavorful pleasure with a touch of lovely pain, but it lacks the intensity of a truly hot salsa. Okay, "pain" might be a little too strong a word to use. Discomfort? I dunno. There's a certain quality in good salsas that just lets you know you're alive. That's here. This product has that, most definitely, despite a lack of traditional heat. 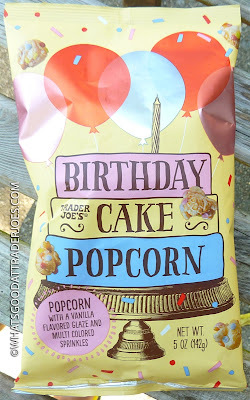 It has a bit of a chipotle flavor, but not so much the chipotle spice factor. Sonia liked it as much as I did, immediately spouting positive remarks about the savory flavors in this tomato, onion, and red bell pepper-based condiment. It's a win—a sure contender for the Pantheon had it been full of crunchy pepitas. I'm not sure if it's been done before, but how about a salsa with a cellophane baggie of dry pepitas that you mix in when you serve it...? I guess you could always purchase a bag of pumpkin seeds separately and create a salsa worthy of even more praise. $2.99 for the jar. Probably a repeat purchase for us. From across the aisle, it beckoned. I was solely aiming for some frozen chicken when it's bright cheery blue neon packaging called out, an irresistable siren. "It's just not fair," I exclaimed to the nice woman stocking the frozen goods case nearby. "You all need to stop doing this." We laughed, smiled, and shared a nod of understanding. The cashier smiled, grinned and exclaimed, "Oh boy? When did we get these?!??!?! Where are they?" Promptly after checking out my cart, off he ran, undoubtedly an impromptu sample party on his mind. The wife cheered. The kids surprisngly got a lot more interested in eating their dinner in a timely fashion. Even their spinach, of all things. And me? I felt warm and happy inside. Anticipation for something good is a healthy drug. What singular thing could possibly elicit all these responses? 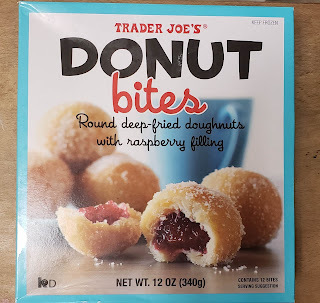 None other a brand new box of Trader Joe's Donut Bites. Donuts! Who can hate on donuts!?!!?!? Everyone loves them! At $2.99 for a boxed dozen, it's a no-brainer buy. I mean, just look at them on the package...flaky sugar atop warm sofy doughy donut with some sweet 'n tart raspberry jam oozing out...good luck resisting that. Well, I will be going forward. Hate to be the bearer of bad news...but this isn't close to being a particularly good product. 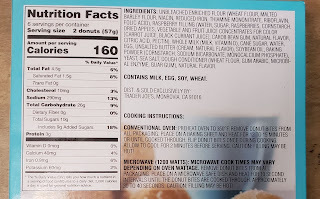 It's enough that I really wonder how anyone can mess up a donut so bad. 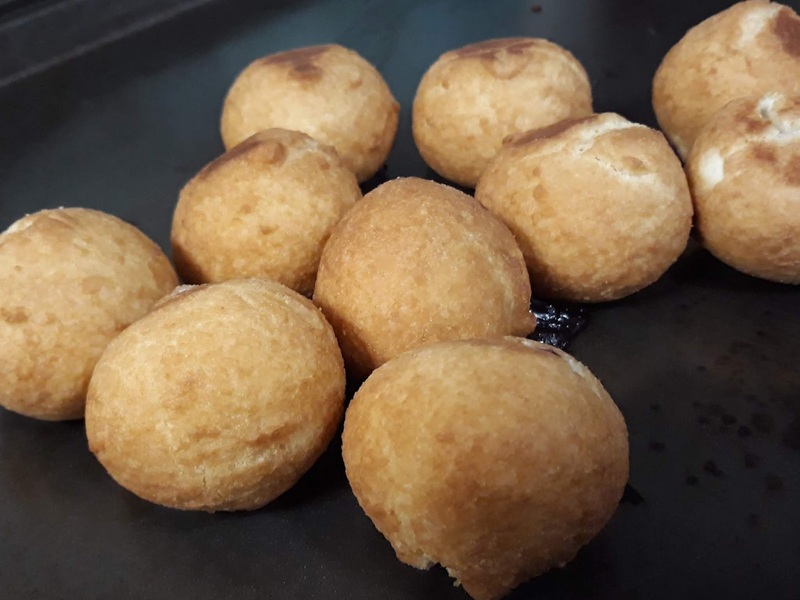 First of all, look at them, straight out of the oven. It's a nondescript semi-leaky doughball. Looks nothing like the package. Second, who bakes a donut, really? Third, the donut dough tastes alright and has an okay feel to it....but it's more bready than an actual donut should be. Which makes no sense, but it doesn't have the donut feel or taste at all. And fourth...the jam. A good filling could salvage a lot here. Nope. It's more red pectin ooze than anything. No sugariness. No tart as one would expect from a raspberry. The jelly's almost completely devoid of flavor by itself. It's always amazed me that veggies like zucchini, carrots, rhubarb, and even pumpkins can provide the base for delicious desserts. Zucchini bread, carrot cake, pumpkin pie, and rhubarb pie? Heck yes. But prior to sampling each of those goodies, my intuition told me to steer clear. I was wrong. Hey, it happens to the best of us. Bananas on the other hand? That's just a no-brainer. 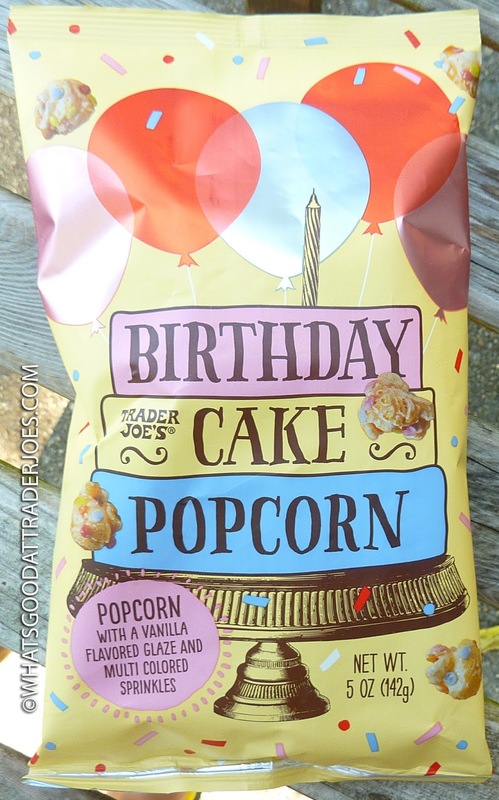 Of course they would make taste-tastic treats. They're already sweet, they have an almost bread-like consistency, and they're super malleable. Since it lacks the intimidation factor of vegetable-based desserts, I've been sampling and praising banana bread from my earliest days—so the bar has been set pretty high. This offering is obviously vegan, which means no eggs or dairy—and in our opinion, as non-vegans, this product doesn't suffer at all for want of animal products. It's soft, slightly sweet, and has a nice bready, banana-y flavor. 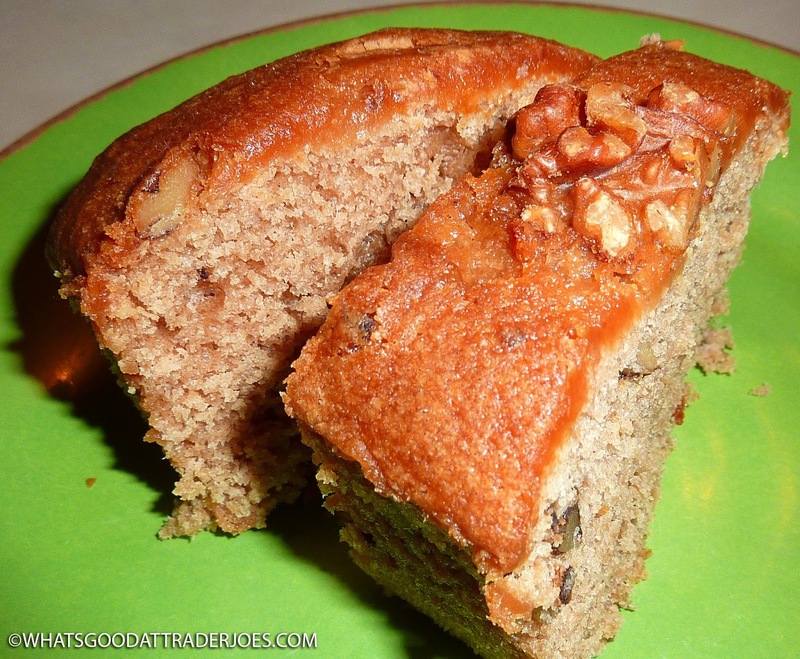 The walnuts add a pleasant touch, although, there could be a few more of them. It might have required some kind of refrigeration, but I wouldn't have minded some real banana chunks scattered throughout the loaf. 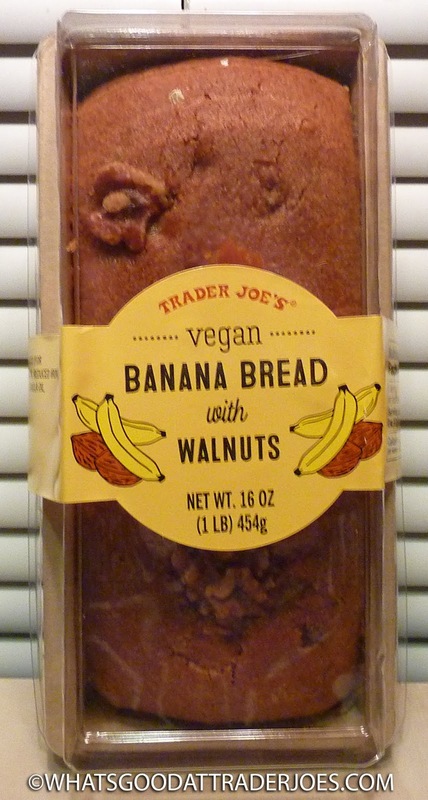 All in all, it's comparable to most other shelf-stable, pre-packaged banana breads I've had. It's no competition for homemade or fresh-baked, but it's a pretty impressive accomplishment considering the lack of animal-based elements. This is one of the tastiest vegan desserts I've had in recent memory, and at about $4, it's worth a whirl whether you follow a vegan diet or not. Sonia would have liked to see this product go the alternative grain route. 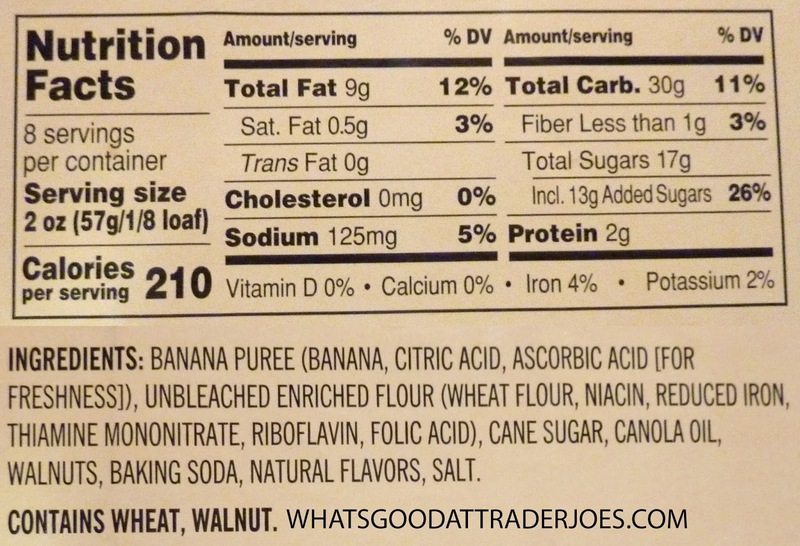 Unbleached, enriched wheat flour is so...commonplace and humdrum, even if you don't have celiac issues. Since this bread is already flirting with that "healthier alternative" vibe, we wouldn't have minded a gluten-free offering here. Maybe in the future. I often find rice-based flours taste better to me anyway, so I'd almost always pick the non-gluten offering if it were available. All things considered, this is still a thumbs up from both Sonia and I. Four stars from her. Three and a half from me. 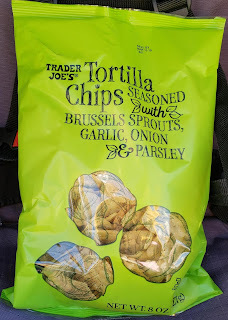 It's probably been mentioned, but when my family goes on vacation, there's three basic kinds of must-do stops: a zoo, a baseball game, and Trader Joe's. Zoos are always fun with small kids (although we live less than two miles from the local one and never go...), baseball is fun for Sandy and I, and Trader Joe's? Well, you gotta eat anyways. We don't have the budget to have every meal out and don't wanna eat nothing but fastfood either. But that's not the biggest reason. It's just fun to go see the different TJ's. Each own has their own local flavor. And perhaps most excitingly to us native Pennsylvanians, most out of state TJ's have beer and wine...and some even have booze like Trader Joe's Speyside Single Malt Scotch Whisky, as procured on summer vacation when passing through Louisville, KY a few months back. I like me most single malt scotch whiskies, but this one? Not a huge fan of it as is. Can't quite state why. I've never heard of any "speyside" whiskies which just might show my complete depth of ignorance...apparently it is so named after the region of Scotland by the River Spey. Sounds quaint. They're also known for their salmon around there too. I'd probably love it there. The label states all sorts of stuff: "slight sweetness", "toffee notes and a floral elegance," "flavors of caramel , dried apricots, vanilla and light cinnamon spice," a "smooth oaky finish." I'm not sure I'd say or taste all of that...but there's different a lot of here and there going on, with a fairly alcoholic burn. It's enough that for me, I need a little ice in it to melt. Whisky on the rocks isn't always my preferred presentation, but to make it drinkable it's what I need here. That helps mellow everything out into a more cohesive flavor, versus it being all over the place. I will tell you this though: this just might be the perfect whisky for mixing. I could see spiking some punch or whatnot with it...but Sandy made me a cop of TJ's fox tea and poured some of this whisky in for me for when I got home from the day job today. It was FANTASTIC. So perhaps that's where it strength lies. It's also pretty cheap. Can't recall for sure, but it's around $10 or $15 for the 750mL bottle of 80 proof booze, so you get your money's worth. There's certainly a lot worse out there in similar price range, but I'm also not lamenting that the nearest bottle for sale is at least a six-ish hour drive away. I'll more than deal with that, and will be looking for something else next time we're on a trip. We'll give it a 5 total. Currently visiting a booze-friendly state, Sonia and I decided to check out what the local Joe's had to offer in the way of exotic libations. In addition to canned wines and the standard Josephsbrau offerings, we spied this gem wedged in between the Three Buck Chuck display and some non-TJ's brand pumpkin ales—relics left over from an America that still tolerated pumpkin spice. Not surprisingly, this isn't the first pumpkin liqueur we've ever sampled. I'm quite certain we've had more than one other brand, in fact, but the names of most escape me at the moment—mainly because they were entirely unworthy of note. The one other brand that's not bad that I can still remember is Fulton's Harvest. This product is comparable, but both Sonia and I agree it's slightly better. 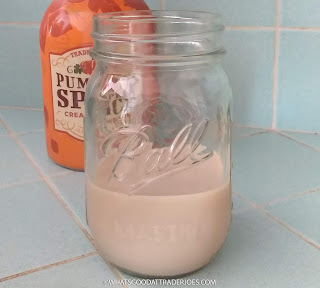 Like Fulton's Harvest, this beverage is thick and smooth—similar to Bailey's or any other cream liqueur, for those of you unfamiliar with the pumpkin varieties. It's creamy, syrupy, and velvety. It's nearly the same consistency as non-alcoholic dairy cream—although, in this case, it's like the cream you'd get from an alcoholic cow that eats a lot of pumpkin spice. 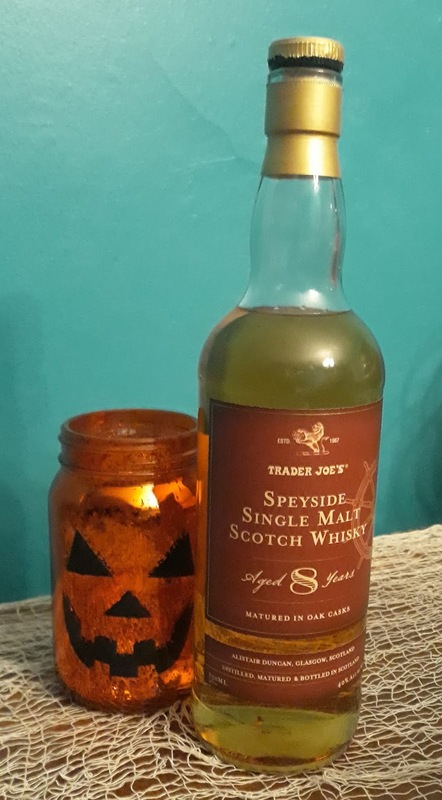 The flavor here starts off with a liquor-laden bite, but then gradually, the pumpkin spices open up on your palate. There's a nice balance of nutmeg, cinnamon, and ginger. It's like a sweet, liquefied pumpkin spice pudding, with just a bit of a kick. It'd be great, along with some vanilla ice cream, as the base for an autumnal adult milkshake. The alcohol content is similar to that of an average wine at 12.5%. It's strong enough to give the lightweights a buzz, but since it's so thick and desserty, it's difficult to down more than a shot or two at a time. Along with the recently-discovered Spiced Pumpkin Madeleines, this product is a winner. I'm sure it won't make quite the splash on social media that it might have circa October 2014, but if you're a drinker and you like pumpkin spice, Sonia and I will tell you it's definitely purchase-worthy. $8.99 for 750 ml. Double fours on this one. Are we pumpkin spiced out? Here we are....halfway thru October...and there's been nary a new, exciting, enthralling, OMG-worthy debut of anything pumpkin spice related. That's fine by me. When we've reached the tipping point of society where the local garage is advertising pumpkin spice brake pads, it shows we've gone too far. Cinnamon is far too crumbly to offer decent stopping ability anyways. In my opinion, maple really ought to be the official flavor of fall. Can't get enough of it. It goes well with almost anything. It's far more versatile than most people give it credit - think beyond pancakes, people. Maple is where it's at. And so it is with Trader Joe's Organic Maple Butter. 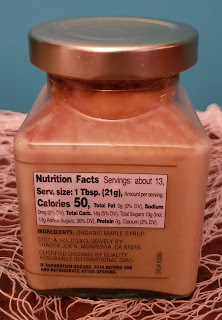 It's really tempting to compare TJ's maple butter with something like their maple sugar candy, although that wouldn't be precisely accurate. Whereas maple sugar is highly concentrated nature sugar bomb from boiling down maple syrup to remove liquid, maple butter is simply churned maple syrup that got agitated to the point of creaminess. That's it. As a result, it's still very maple-y, of course, but not quite as much as maple sugar. 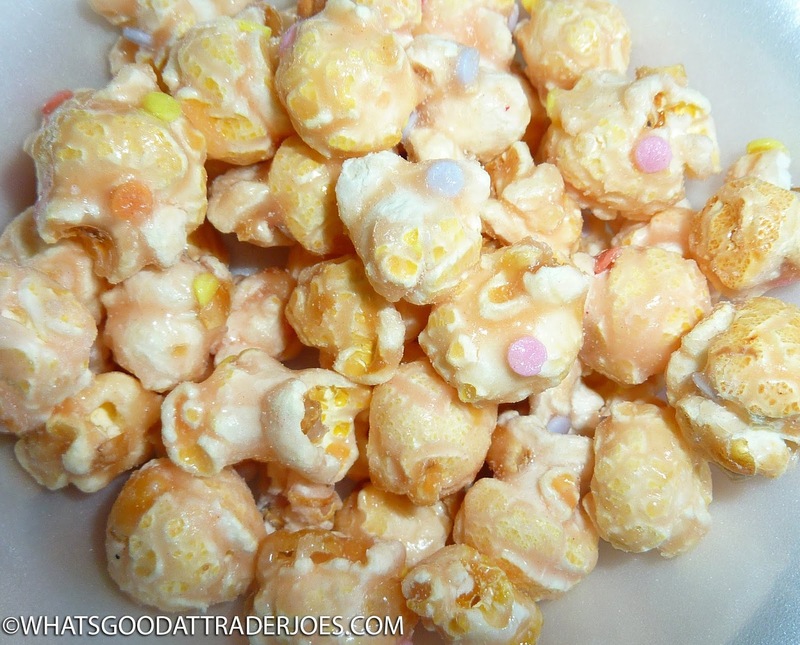 There is a similar feel though, in that there is a slight chalkiness from the sugar granules. It's nowhere near offputting. The maple butter is pretty darn excellent. 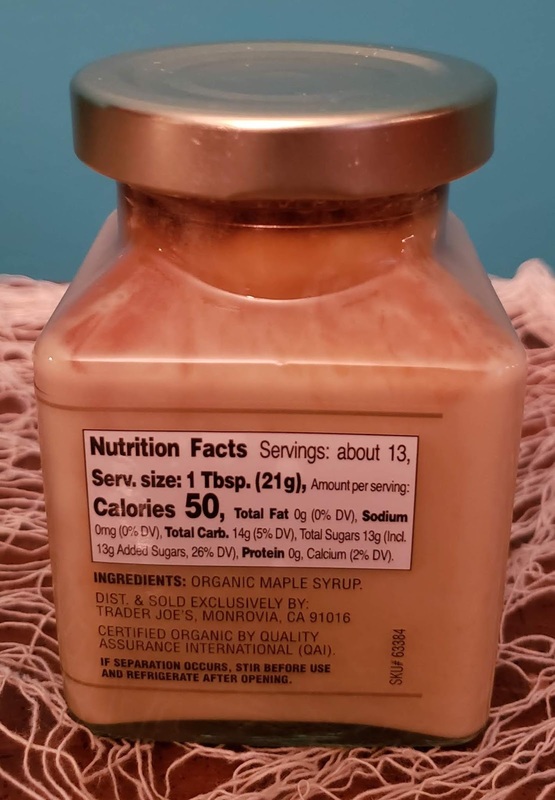 It's absolutely creamy, smooth, and a little bit drippy and runny, but nowhere to the same extent as regular maple syrup. That might make it an excellent "mess control" option for the younger crowd. Like regular butter, it will melt/seep into something warm if placed on top of it, like on top our sweet potatoes the other night. Put it on anything though - veggies, toast, pork roast, chicken, ice cream, etc. And yes, I guess even pancakes too. 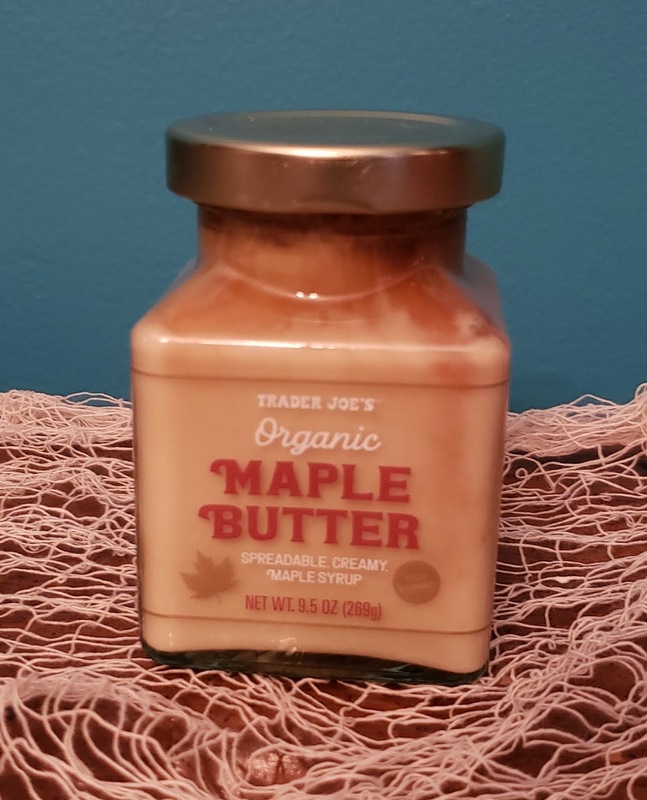 It's $5.99 for the small jar, which is about in line pricewise for most maple products. It's not an awful value. I'll admit to being tempted to just guzzle the whole jar down. Love maple and anything maple, as does Sandy, so it's an absolute winner from us. The only thing keeping it from a perfect score is the small lack of anything truly amazing/unique about it, but that doesn't mean it's not worthy of your pick up next time you're at the shop. It's a small jar, you'll find room for it alongside all your pumpkin spice crazy stuff. "I didn't choose the mug life. The mug life chose me." It's kinda true. This product has been out for at least a month or so, I'm pretty sure. It's not particularly fall-ish. I'm just reviewing it by default since we don't have any spectacular new pumpkin things to check out and we're between TJ's runs at the moment in our household. 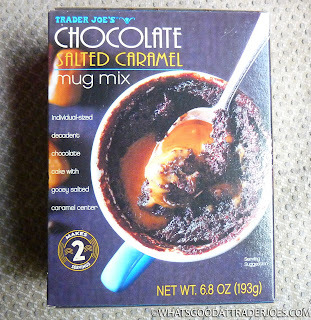 But we do have a microwave and mugs, so chocolate salted caramel mug mix, here we come. 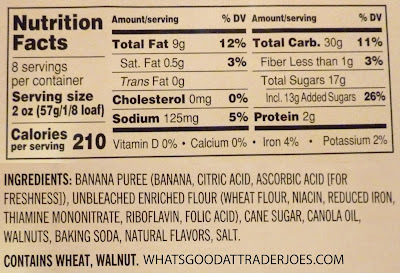 I'm a fan of substituting water with milk any time something cake or brownie-ish comes along. But in this case, I didn't have any milk on hand, so water it was. The product still came out fairly rich and creamy, despite the absence of actual cow juice. I guess there's a bit of condensed milk in the caramels, but you know what I mean. No milk was added. I actually followed the instructions for once. First impressions: I'm really surprised at how easy the product was to make. If I had been handed a dessert like this at a fancy restaurant, I'd have marveled at what wizardry might have been responsible for getting actual salted caramel into the middle of a brownie in the middle of a coffee mug. I never would have guessed in a million years that it could be as simple as plopping two unwrapped caramels into the mix during a 40 second microwaving process. And yet that's it. Stir water into the mix, heat, drop caramels, heat again. Done. My foodie-hack prowess is responsible for the odd streaking marks on the sides of the mug. I'm sure with a little patience and care, one could spiff the presentation up a bit more than I did. Also, for some reason, the colors of the brownie turned out a bit redder in this picture than they appeared to my naked eye. Not sure what I can attribute that to. I either need to white balance my camera again or get my eyes checked or both. Or neither. It's not a big deal, is it? Flavor-wise, this product is quite sweet. I've mentioned many times before that I do have a sweet tooth, but I'm craving sugary stuff less and less in my old age. This, surprisingly, was one of the most cloyingly sweet items from Trader Joe's in recent memory. There's a bit of richness to the chocolate, and you can definitely taste the sea salt of the salted caramel, but the dominant essence was very sweet to my tongue. We've seen the Fleur de Sel Caramel on this blog once or twice before, and it's a quality product for sure, but it is quite sweet, as well as salty and creamy. This time, it comes in the form of cellophane-wrapped, bite-size chewy candies—four of them, two for each of the two suggested servings. 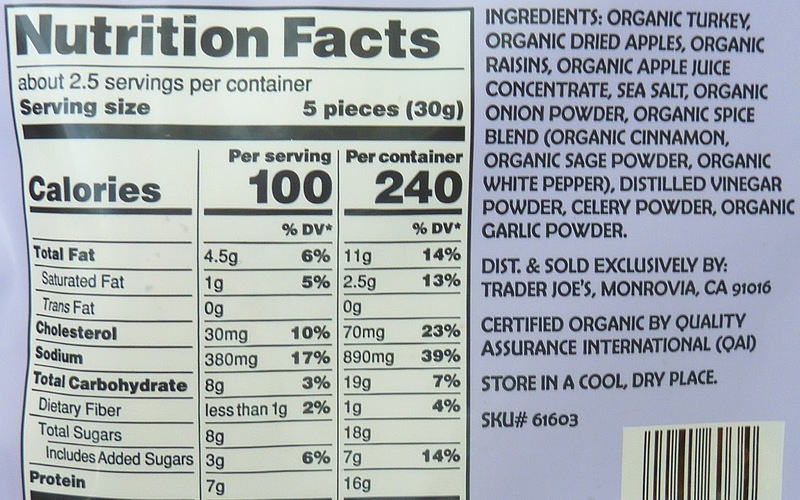 I should also note that there are two individual packages for the cake mix, too. All the measuring is already done for you. The flavors of the brownie and caramel come together nicely, despite the sweetness. I can't complain about this product too much in the end. It's very convenient and fun to make. The texture is everything you'd want and expect from a fresh-made brownie filled with gooey caramel, and the price is right at $1.99. I probably wouldn't purchase again just because it's rare I crave chocolate and salted caramel these days, but if you do, this would definitely be a product you should reach for. "Now THIS is my kinda cereal!" Now, if this would have been uttered about, say, some pretty decent hot cocoa-inspired cereal, or some special edition Lucky Charms, or heck, even a fresh box of Honey Nut Cheerios, I'd understand. Those are all great cereals with a lot less ho-hum than an average bowful of corn flakes. 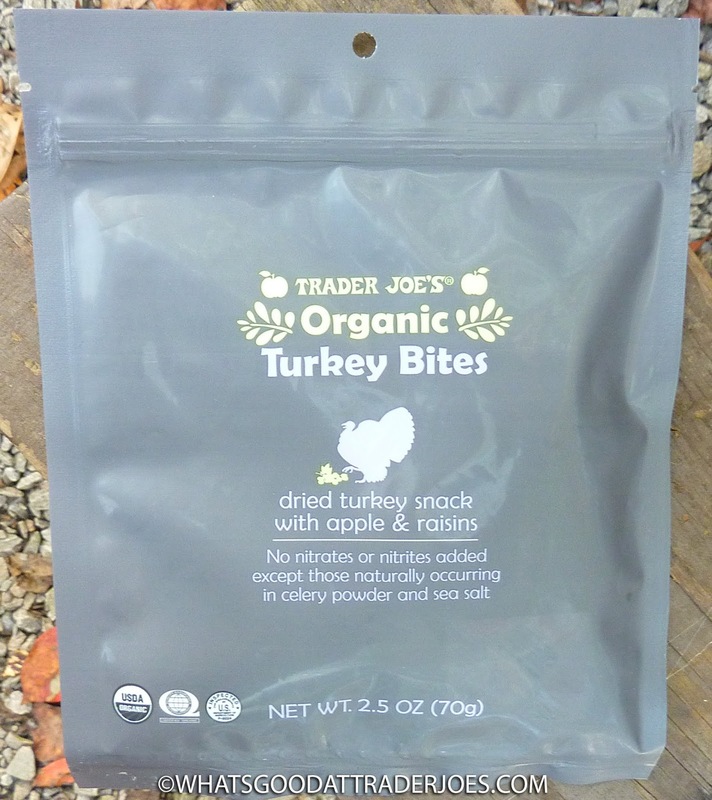 But...something like Trader Joe's Crispy Quinoa Stars Cereal? Really? People can get hyped about, of all things, quinoa for breakfast? Wow. Apparently the answer is yes. And apparently one of those people is my lovely bride, as she happened to exclaim that exact phrase with spot-on inflection that implied complete excitement as she snagged the box and happily tossed into our cart. Well, okay. Alright. Guess I can give it a try, too. After some debate, it seems to come down to a simple fact. 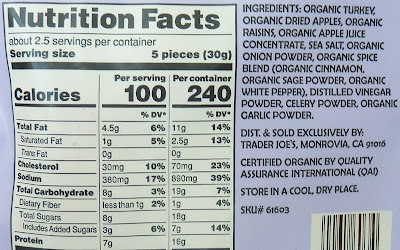 There's certain grains that are much more prevalent for breakfast cereals. Corn. Rice. Wheat. Oats. 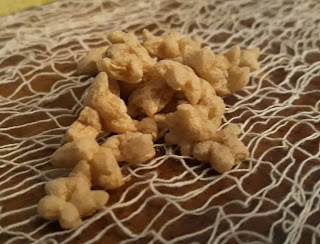 As a result, there's a certain level of acclimation and acceptance that can be a little hard to wander outside of, especially when grabbing a handful for a comfort snack, as is my most usual matter of cereal consumption these days. I think that's what my perceived issue is. These quinoa stars taste exactly what I'd expect a quinoa-based cereal to taste like. They're super earthy, a little nutty. 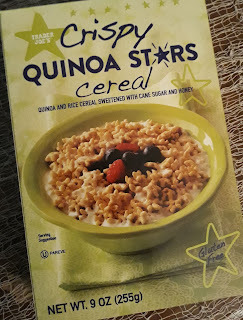 There's a small touch of honey to try and sweeten the whole deal, which kinda works, but can't fully cover up the whole quinoa-ity of the cereal. As a result, there's also this lingering aftertaste that seems to intensify. I ate a small handful as I sat down to write this, and I can still taste it all in my gums and it seems to be spreading to the back of my throat. It's not exactly awful, but not entirely pleasant either. There's plenty of crispy crunch, though. My wife states it holds up well in milk. There is a slight stale vibe to them - not that ours are actually stale, at least I don't think so. But after occasionally consuming verified stale cereal, there is a small similarity, and I actually don't mean it as a knock. It's just a base for comparison. And this is perhaps a small thing...but the packaging here is a little wacky. Of course, it's just a bag inside the box...but our inner bag was a full two inches shorter than the actual box. I've never seen a cereal box with that much headspace. It's odd. Overall, I'm not gonna hate here, as I'm not the target audience. 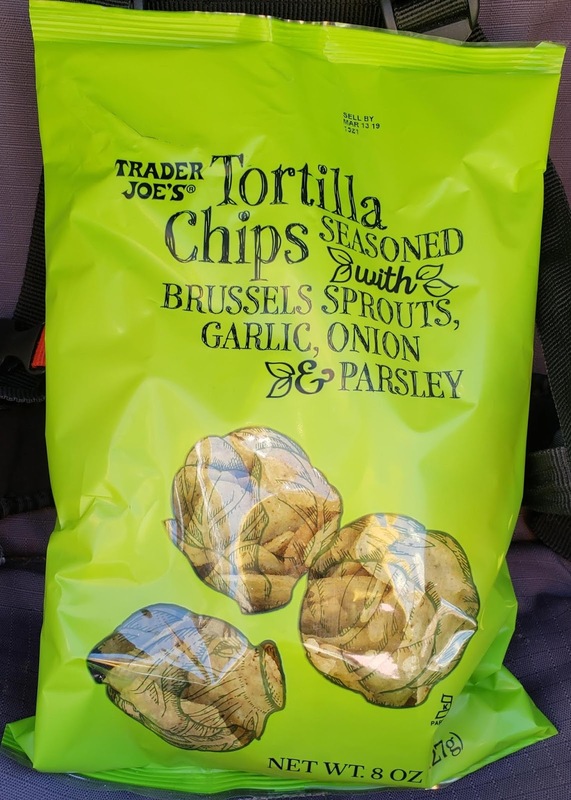 As someone with no gluten restrictions but knowing enough people who do, anytime a half decent gluten free product at a good price ($2.99) comes to market is a event worthy of at least a little celebration. But I can barely eat more than a small handful or two, and I'd probably not enjoy a full bowl. Sandy's kinda the same way, although she enjoy it more than I do and claims she'll buy it again. We'll see, as her initial enthusiasm has certainly dulled in the past few days. "I don't hate it" is about all she'll say. That's a far cry from the parade I thought she was gonna throw for it....eh well. Two spoons from me, three from the wifey. Never gave it much thought until recently, but there is a difference between "spooky" and "scary", isn't there? There probably are a few different working definitions and delineations floating around, but for our kids, we define "spooky" as something that's maybe a little scary but fun, like most of the Halloween decorations in the seasonal section at Target right now. I swear both my girls could spend hours just roaming through those aisles, looking at the skeletons and creepy ghost clocks and phones and whatever else, and laugh and giggle the whole time. That's "spooky" for us - bed sheet ghosts, Jack-o-lanterns, spiderwebs, etc. Scary is something else, like legitimately frightful...like trying to watch The Lion King with them. Never saw either of my kids petrified as much as during the scene with the hyenas and stampede. They almost looked like me opening up our utility bills. Somewhat similarly, there's a difference between fruit snacks and fruit-inspired gummy candies...I guess? Again, it's not a topic I gave much thought until we picked up Trader Joe's Halloween Gummies on a recent shopping trip. Scary snacks? Spooky gummies? Something else? In our household, we're most acquainted with Welch's Fruit Snacks due to the endless crate we have of them from our local Costco. It's a bottomless well. 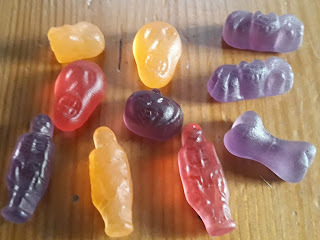 So it's them I'm comparing these TJ ghouly gummies to most directly. There's a decided difference, for sure. Whereas the Welches are softer and more singularly fruit-flavored, the haunted house brand from TJ's are much firmer and more of a flavor blend. Gummy or gummier are not quite the right words...just firmer, with a bit more chew. That's not a bad touch, and is presumably because the first ingredient is glucose syrup (i.e., wheat) and not fruit puree. Hrrrr...I do like the sound of fruit puree better. One thing definitely in TJ's favor: The respective coloring agents. Black carrot, apple, pumpkin, black currant and spirulina sound a lot nicer than Blue 1 and Red 40, don't ya think? 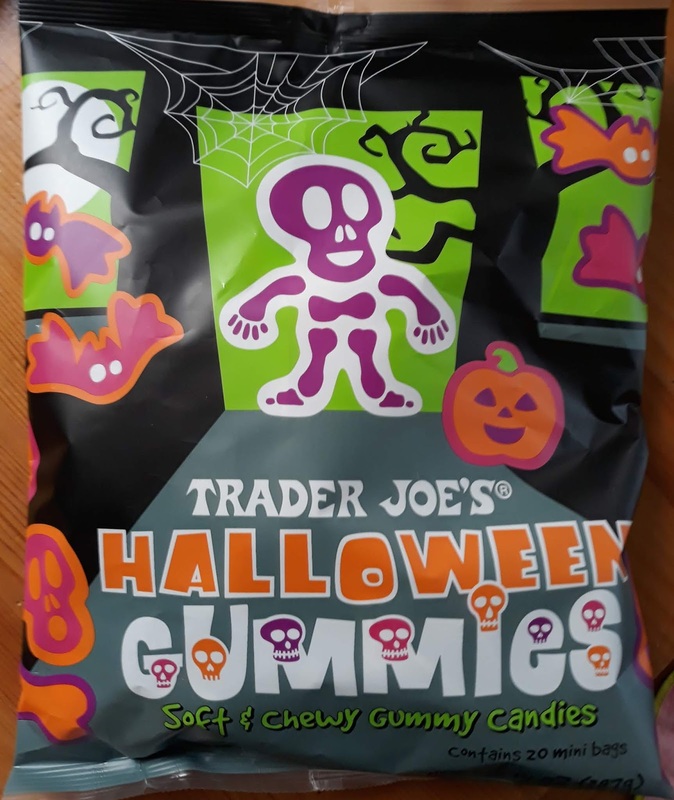 I also like the TJ's seasonal spooky shapes: Skeletons, skulls, bats, bones, and some unidentified glob. Nice. It does make them a little fun, although the different fruit shapes with Welches at least add to a perception that each fruit shape tastes a little different. The TJ's? Not so much. It's more of a general sugary fruit punch flavor more than anything else, which take a good chew or two to really get going. It tastes good but gets a bit dull after a few. One other thing to love: the price! It's just $3.99 for a sack of 20 minibags. That's less than 20 cents each! For us, that makes them perfect for little lunches or snacks on the go (our girls love anything resembling a fruit snack), but man, you can load up for trick-or-treaters! Yes, that won't make you as cool as those rich folks who give out king size Butterfingers, but at least it ain't anything close to raisins. That ought to be illegal. We like 'em, our kids like 'em, you're likely to like 'em too. Nothing to get spooked about here. Double fours. This past week, our household has been chaotic to say the least. 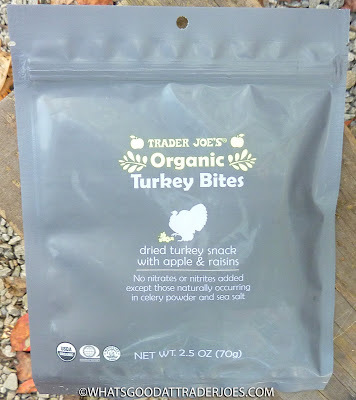 We generally like to share a bit of our lives with you here on this blog—to mix a personal story or two in with our thoughts about whatever Trader Joe's foods we're eating. At this juncture, we're just not ready to get into specifics, but I will mention that there have been some truly wonderful, life-altering changes with us recently, as well as some terrible tragedies. They've affected our whole family, but none more than my dear wife. It's remarkable how when the tides of change are churning and this crazy world's got you on your knees, a simple song or film or photograph can generate a transcendent moment. Food can do that sometimes, too. I'll just put it this way: Sonia is madly in love with this product. This is one of her favorite fall foods ever, which puts it high in the running for her favorite thing ever. She gobbled up her share of the soup swiftly, remarking "wonderful," "fabulous," and "amazing" as she ate. Haven't seen her this enthralled with a product in a very, very long time. She had been understandably surly and sullen just moments before, but this chili got her right real quick. She even closed her eyes, smiled, and hugged herself as if in some euphoric dreamland, punch-drunk on squash, pumpkin, and black beans, much like the dude who put the label on our tub apparently was at the moment of application. She even liked this stuff cold. Me? I see where the wifey is coming from, and I like it, but I'm not quite as enthralled. 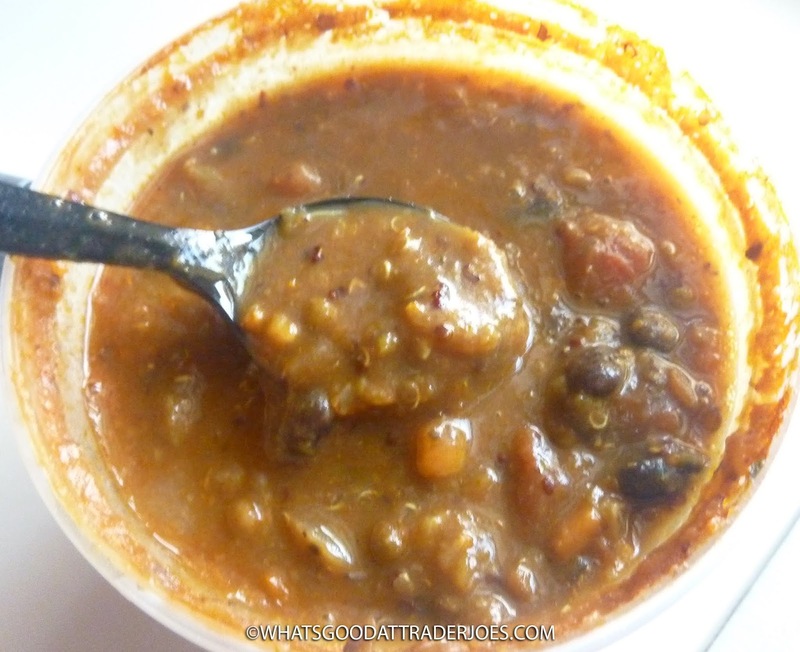 This might be the least chili-ish chili I've ever had. 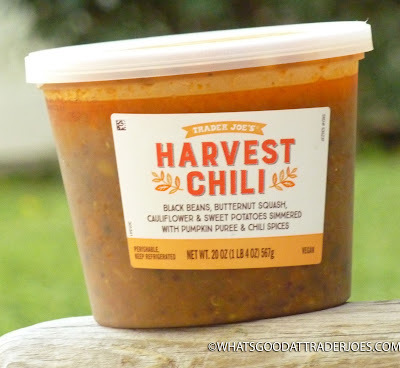 It's more of a "chunky harvest squash soup" if you ask me. Chili spices? Yeah, I guess they're in there, but they're not very dominant—I wouldn't have minded a significant boost in the heat department. 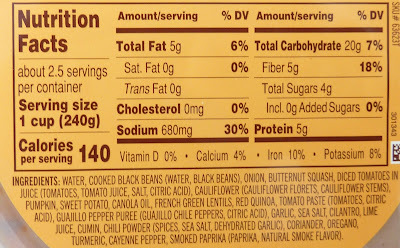 Also, there's not enough beans to be chili, if you ask me. I wish there were some traditional kidney beans in there. 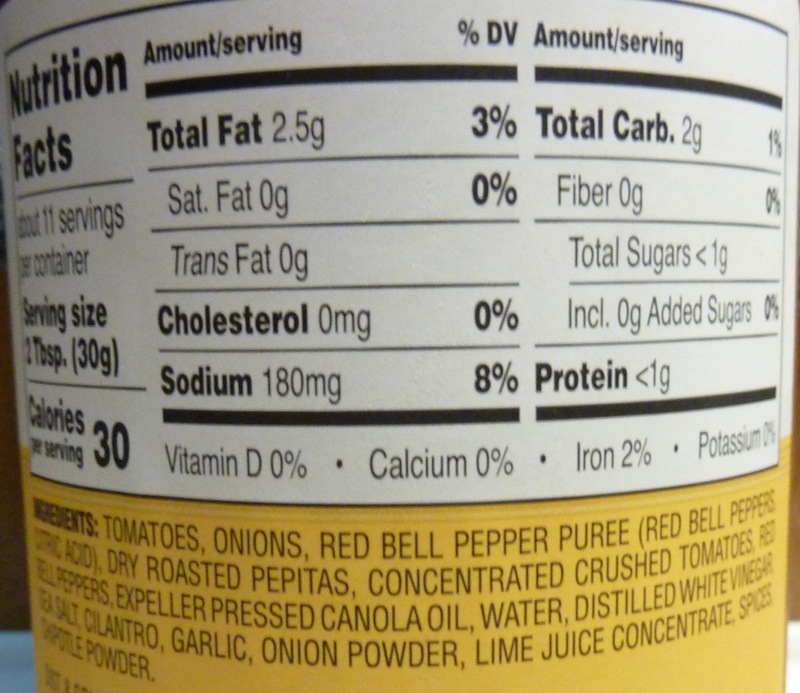 On the plus side, there isn't a whole lot of tomato flavor. There are diced tomatoes, but most of their essence gets lost in the mix. Never been big into the taste of actual tomatoes. The dominant tastes and textures here are those of squash, cauliflower, and quinoa—and a nice peppery, garlicky broth. It's certainly unique—not particularly chili-esque, but thick and tasty nonetheless. $4.49 for a decent size tub. Plenty for both of us, either as a side dish or the main course. Five stars and several emotional tears from Sonia. Three and a half stars from me.